Apple Watch Series 4 beginner-to-pro manual. 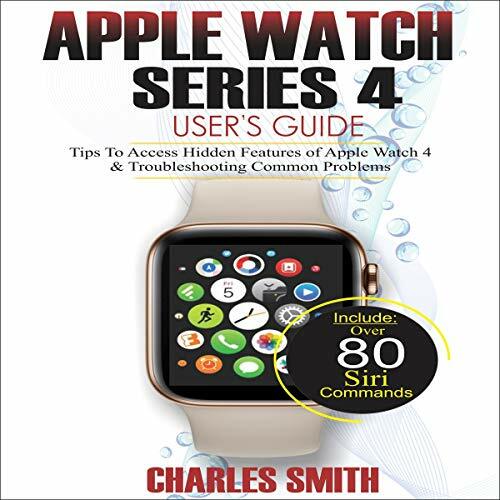 If you just got an Apple Watch Series 4 and you intend to be an Apple Watch expert in 60 minutes, then this audiobook is for you. The Apple Watch 4 is designed to help anyone who wears it live a healthier life by been more active. It's for people who want to be active throughout the day to those who work out a few times a week to athletes committed to improving their performance. Apple Watch 4 brings together the capabilities of an all-day fitness tracker and a highly advanced sports watch in one device. It tracks a wider variety of activities because it is able to collect more types of data. It uses an accelerometer to measure your total body movement; it also has a custom sensor that measures intensity by tracking your heart rate. It also uses the GPS and Wi-Fi on the iPhone to track real-time locations and movements. The Apple Watch 4 gives you a complete picture of your daily activity - not just highlighting the quantity of movement, but the quality and frequency as well. It is designed to get to know you over time as a good personal trainer would. It does this by delivering intelligent reminders, keeping you motivated and on track. It can also suggest goals that are personal, realistic, and most importantly, achievable, which gives you a far better chance at succeeding in your daily fitness routine. This audiobook is designed as a complete beginner-to-pro manual. It also provides some hidden tips and tricks you never knew could be performed on the Apple Watch Series 4. Do not wait any longer, download Apple Watch Series 4 User’s Guide right away and start your journey from beginner to badass Apple Watch enthusiast!